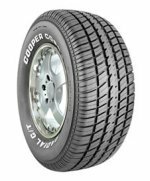 Cooper Tires describes the Cobra Radial G/T as a 'Cosmetic Performance Tire', although reviews have been positive for more than just the aesthetics. Many car owners purchase these tires for older muscle cars (mostly domestic), as the Cobras offer the traditional raised white letter styling. These tires are great if you want a wider tire with more rubber to road footprint. This helps to distribute the weight of the car more evenly, thus improving handling and tread wear. The speed rating on these Cooper Tires are M+S, which qualifies them as being 'All Season', but it's hard to find online tire reviews from people who drive in snowy conditions. There have however been many reviews from those stating that they handle very well in wet conditions. These tires are affordably priced at around $100, but obviously vary depending upon tire size. You can find these tires at Sears Tires for $107 at the time of this review. "Great handling in rain or dry conditions. I drive a truck and these Cobras are very quiet. In fact, I find that they make my truck ride more like a car. I certainly recommend these tires." "I replaced the tires on my Mustang with Cooper Cobras and love the 10 inch wide tread. The wide footprint make them very sticky, and the traction is very good. A great combination." "After putting these tires on my car I felt like my car was on rails. I have never have had a problem with the Cobras. They perform fine in the rain, but I never drive in the snow so I'm not sure how well they do there. I have to say, this tire is not quite as good as the BF Goodrich Radial T/A (at least in regards to traction off the line)." "I had four Cobras on my car and had two of them blow out on the same day. The car had been sitting for quite a while, and I'm sure that had something to do with it. Nevertheless, this made me question the durability of the tires. Before the blow outs I found that the tires felt no better or worse than any tires I've owned in the past." "I have purchased H rated Cooper Cobras. Very nice tire for summer and rain, but performs very poorly in the winter. They have a lot of nylon in them which makes them stiff, but will flatspot in the winter." The Cobra Radial G/T's from Cooper Tires are great all season tires for those that don't need very high performance. If you're looking for a tire for your older domestic muscle car, go check these out at Sears Tire Center. The tires will likely last in the neighborhood of 50K miles, and should do very well for around town driving in dry and wet weather. Those these tires are rated for mud an snow, there are not many online reviews from owners that drive in these conditions. You may want to look at the Cooper CS4's if you drive in light snow, but note that you'll pay more.